You may have noticed that the Garden closed for two consecutive days on January 29 and 30, due to the recent polar vortex for the safety of our staff and visitors. But the extreme subzero temperatures weren’t just hard on humans, they were also hard on some plants. Tom Tiddens, Supervisor of Plant Health Care, said it could have been worse if we hadn’t had an insulating blanket of snow on the ground. Snow is a good insulator for plants that are exposed to extreme cold temperatures, so any plants that were covered should not have damage to their root zone or plant parts covered by the snow. 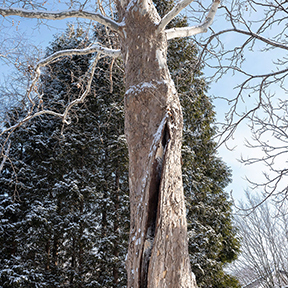 Two sycamore trees in the Sensory Garden developed dramatic frost cracks. Tiddens saw this happen the last time we had a polar vortex in 2014 also to a sycamore. Sycamores hold water in the xylem layer of their trunk more so than other trees, making them more likely to develop frost cracks. There is not much you can do if frost cracks happen. We recommend watching the tree in the coming season to see if it begins to decline, but most likely the tree will survive this injury. Other ways the polar vortex might affect plants negatively is in flower bud survival. Forsythia shrubs could see damage to any branches that were above the snow cover. Forsythia have flower buds along their stems and the stem that were above the snow cover could have the flower buds frozen off, but the flower buds that were under snow cover will survive. Tom saw this happen in the last polar vortex. The bottom portion of the forsythia shrub bloomed just fine, but the top foot or so of the branches did not bloom, just green leaves emerged. We could see a reduced forsythia display this spring. The same snow cover that protected the plants, also protected the insects that spend the winter underground. If the polar vortex occurred with no snow cover, the extreme temperatures could have reduced the number of soil-dwelling insects and could have damaged shallow rooted marginally hardy plants. Japanese beetles, a common garden pest in summer, are one of those soil-dwelling insects, and unfortunately, they will have survived the polar vortex. 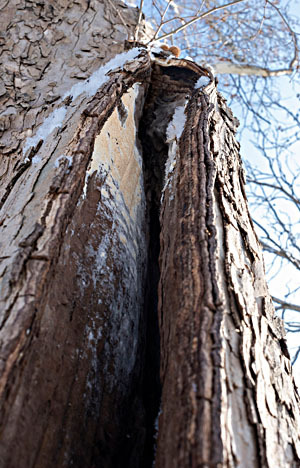 Insects that live in the trees or on the stems of branches during winter might experience some die off, such as emerald ash borer larvae and gypsy moth eggs. Only a sustained period of time at below -20 degrees will result in a significant die back in those kinds of insects. Freezing and thawing is very hard on plants. Big / lengthy temperature fluctuations can sometime fool plants that spring has arrived. If we get a mid- or late winter warm up that lasts more than a few days, some plants could be tricked into breaking dormancy and start sending water to their buds and we will see buds swelling. Those buds could get damaged by more cold temps that are sure to come. We need winter to stay winter for plants to remain safely dormant. The lesson is to choose the right plant for the right place. Any plants that are marginally hardy in our zone, or that were planted in conditions they don’t prefer will be the first ones that are damaged by extreme weather conditions. In fall, you can prepare newly planted trees by wrapping the trunks to protect them from pest or salt damage. A layer of mulch on garden beds placed after the ground freezes but before the snow hits, keeps perennials protected from the freeze/thaw cycle. The mulch layer insulates the roots from extreme temperatures in case we do not get much snow. Why should the ground be frozen before applying the protective mulch layer in the fall? Sycamores hold water in the xylem layer of their trunk more so than other trees, making them more likely to develop frost cracks. 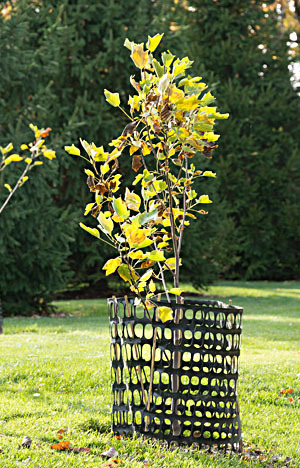 In fall, you can prepare newly planted trees by wrapping the trunks to protect them from pest or salt damage.